User friendly theme for corporate and personal use. We provide FAST AND FRIENDLY SUPPORT to all our customers. Our Themes are easy to setup but if you feel any difficulty you can contact us Any Time. We'll be Happy to Help you. Our themes are managed under single live customizer panel and loaded with lots of unique features. So that, Any Novice can create website without having any code knowledge. You're fully secured under our 30 days money back guarantee plan. As We're dedicated to make you satisfied with our Product. If you're NOT happy? Just mail us, We'll refund your money. Magazina is excellent for Magazine, News & media or any Editorial site. It is a visually stunning, dynamic and interactive WordPress magazine. 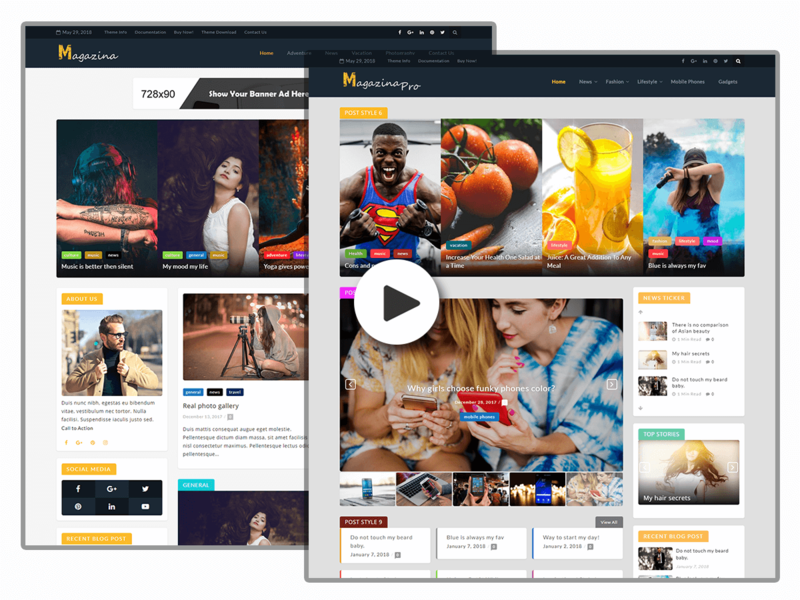 Theme comes with astonishing magazine template (12 different post layout in Full-width and Sidebar with Drag & Drop functionality). Intuitive Powerful Features like : Typography with 250+ Google fonts for showing your content impressively, Styling options for each element, Breaking news slider, Social icons in header & footer area, Unique Post Option, Post Pagination, Post read Time, Top header setting, Sidebar alignment (Left & Right), White Label editor and so on.. Custom Widgets like : Sidebar Post widget, Ad widget (Banner & Google AdSense ready), About Me, Social media, News ticker, Post Tab Widget and Recent post with thumbnail. Magazina is Free. Now & Forever. Magazina Theme is totally free for Everyone. For extending it's functionality . Go with Our ideal Packages.